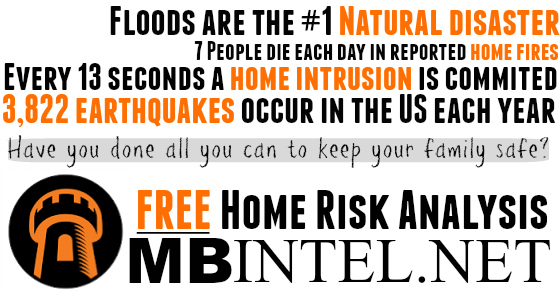 MBIntel offers a great home risk analysis that you can take for free. Every family should be aware of their surroundings in case of an emergency. They teach you great things about safety awareness for you to use not only in your home but in outside activities as well. I was really shocked with my scores. It is broken down into sections which are security, safety and emergency preparedness. Even if you feel like it are prepared for anything I highly recommend that you just take 15 minutes out of your day. This is something that could really make a difference in your life. Your results will not be shared with anyone so you do not need to fear that someone will find out about any of your weaknesses you may have. Visit MBIntel and get your FREE Analysis today! A full version is offered that you can upgrade to, the cost is $29.95 but they have a great deal now through 4/30 you can save yourself $10 with coupon code MomBuzz. Pass this site on to your family and friends.